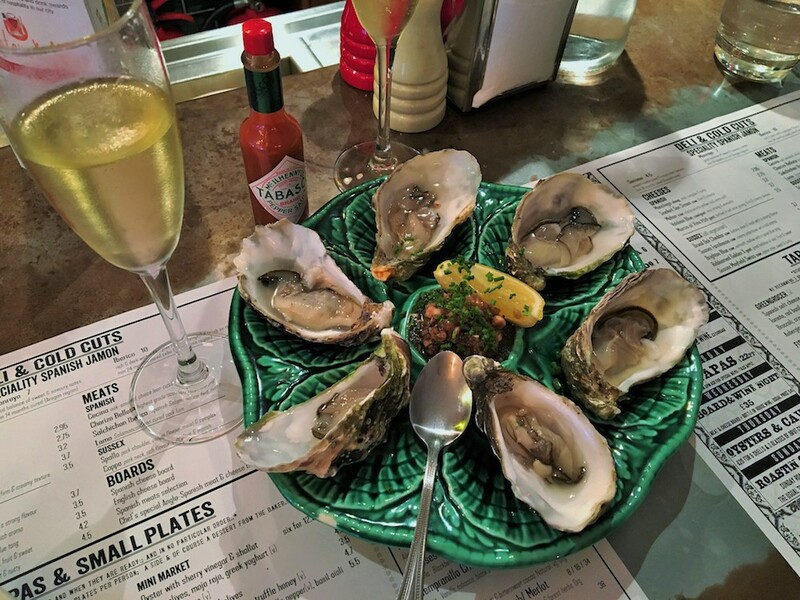 Oysters and Cava Thursdays. Sounds like good old-fashioned fun, doesn’t it? Now I have your attention, I’ll let you mill that over, while I gather my thoughts on Market Restaurant. How can a restaurant run by a Northerner and a lass from Bucks hope to pull off serving small plates “inspired” by modern Spanish cooking? The answer is, beautifully. And why not? 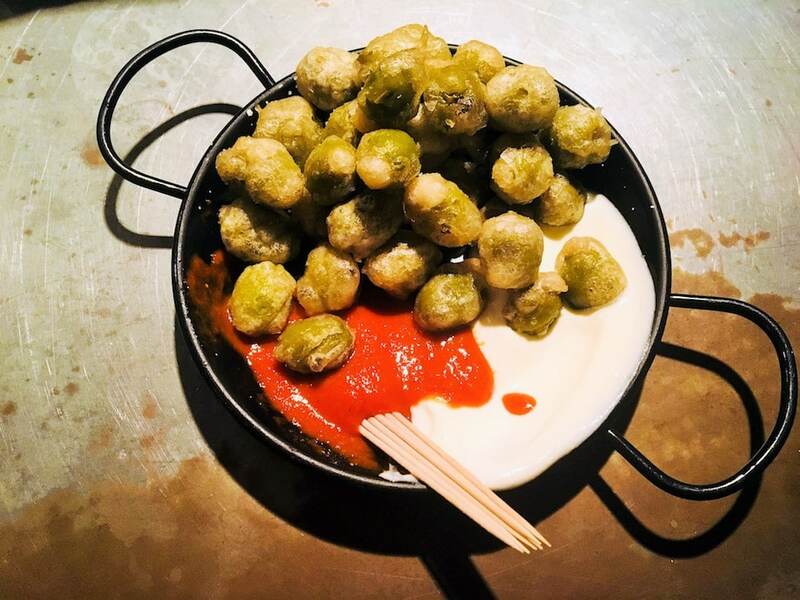 Because just as sure as happy Brits are pouring off Easyjet into the Magaluf sunshine right now, the rest of Spain is busy being the epicentre of progressive cooking. 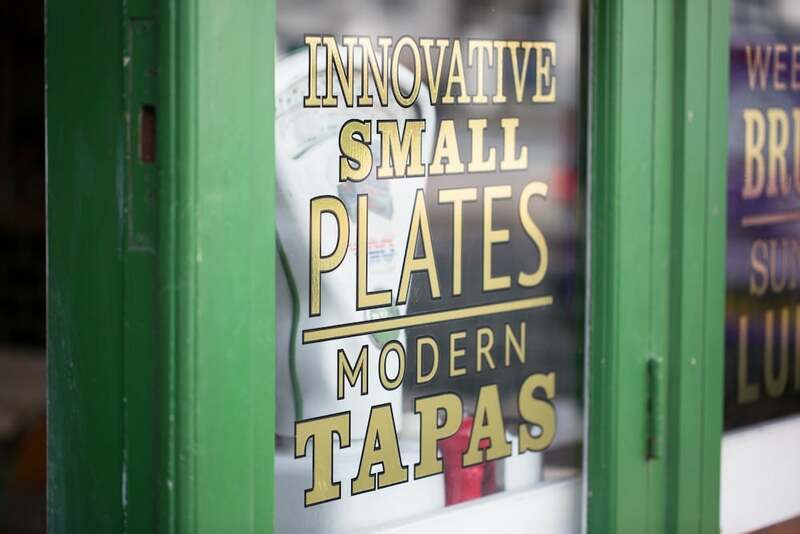 Let’s face it – from Catalonia to Bilbao – the Spanish restaurant industry is killing it. Hardly a bad place to seek inspiration from. 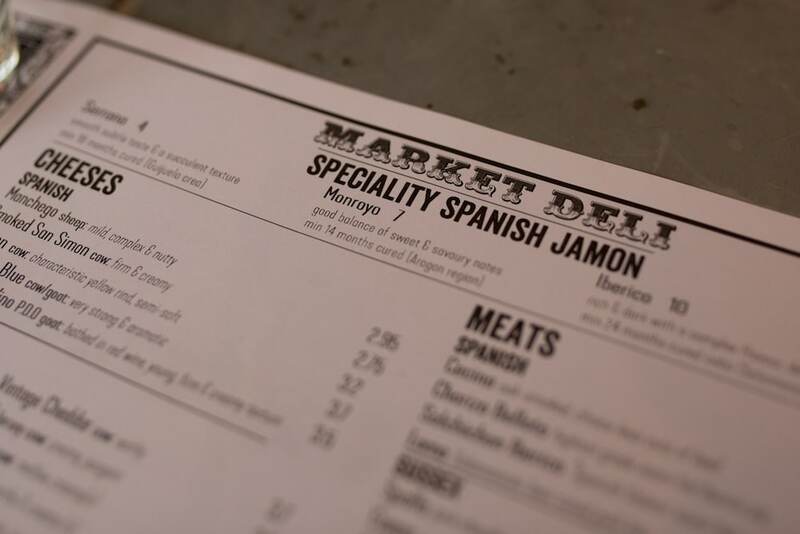 You will find Market Restaurant & Bar where Brighton meets Hove, just on the border, ACTUALLY. 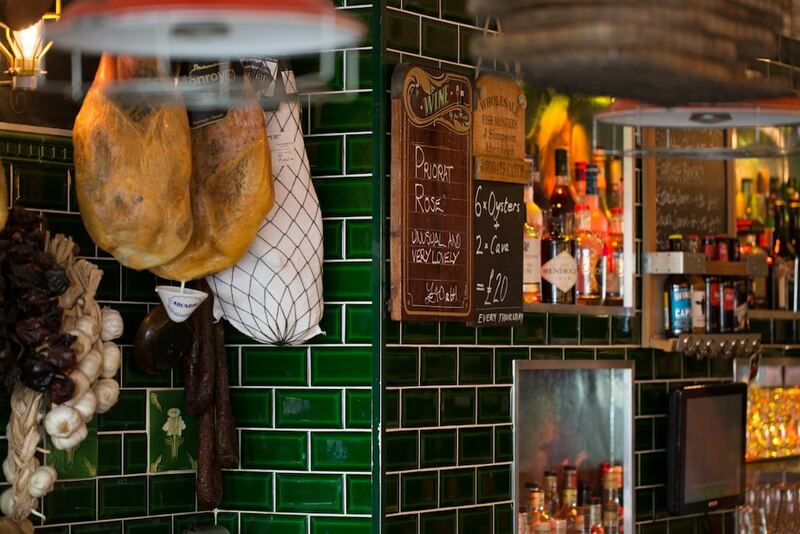 Chic and eccentric, this truly independent restaurant-bar has bags of character. 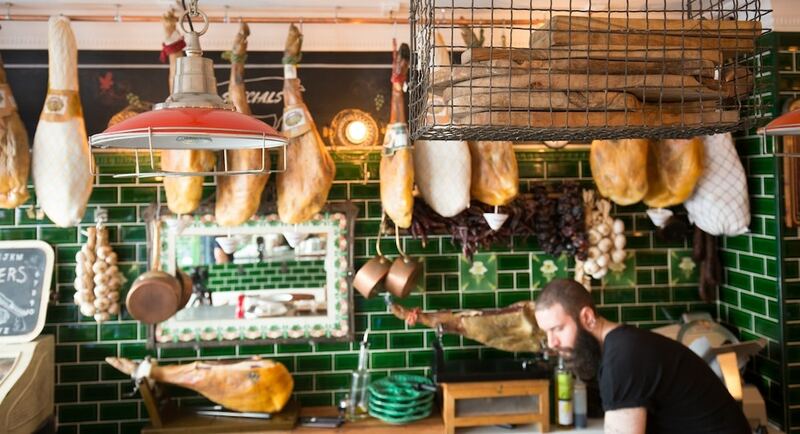 There are shiny bottle-green tiles, great smells from la plancha, whopping big Iberico legs swinging overhead and a cosy, breezy feeling when in summer the giant front is opened for air to circulate. Team this with six perfect oysters, two glasses of robust Catalan Cava Brut and a friend who loves her daughter so much it hurts but “really needs a damn night off” and you have wonderful recipe for some adult-level relaxation. Ah Mini Market starters, the stuff of legends. We’ve skipped paper-thin slices of Serrano and Murcia al Vino, the red wine soaked goat’s cheese served from The Market Deli, in favour of the infamous Mini Market gems. A web of curly Goat’s Cheese Churros with rich honey and truffle. Crispy Tempura Olives with sharp tangy red pepper Mojo Rojo. Market is the restaurant to curry favour with your Vegetarian and Vegan friends without even compromising. Formerly a fine dining restaurant, its owners became tired of creating food that felt inaccessible and elite. So in a stroke of true genius they decided to build a menu around their favourite food and wine regions in Spain, but from the excellent Sussex produce on offer. 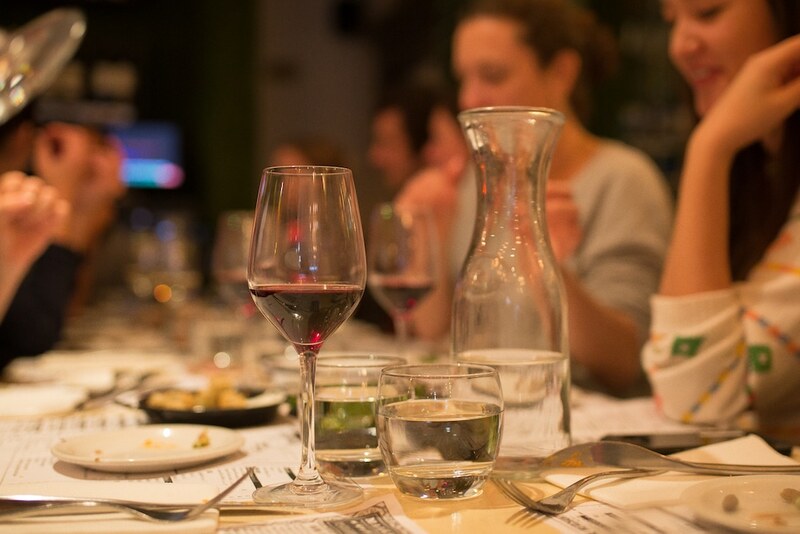 The result was a heady mix of Spanish bravado, carved from local specialities such as Sussex Mayfair Swiss Cheese, delightful cured Spalla and Coppa, rope-grown mussel, each dish leveraging their relationships with local suppliers and wine merchants to delicious effect. 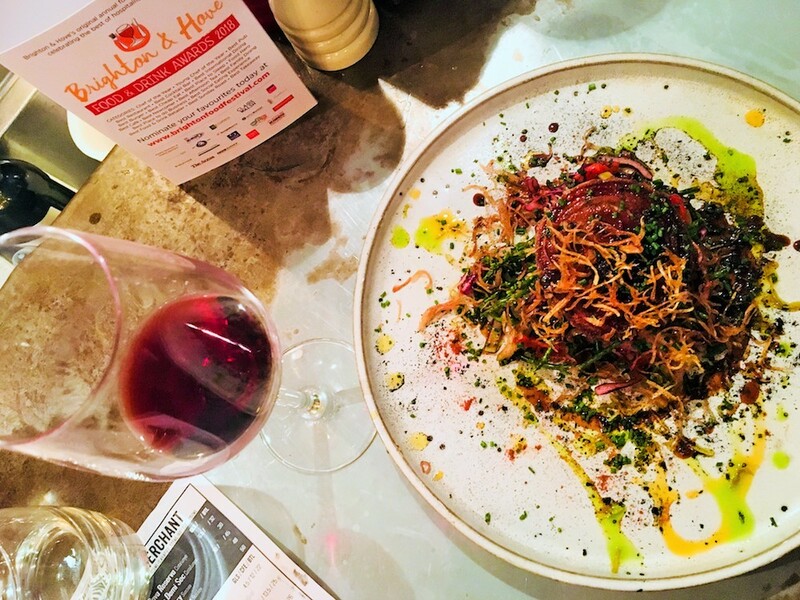 While my friend is repeatedly Whatsapping her husband née babysitter to rub in all that FOMO, we throw down some of newest wines on offer including a tasty dry yet floral blend of Macabeo, Sauvignon and Airen from Alicante – superb for a House Wine. 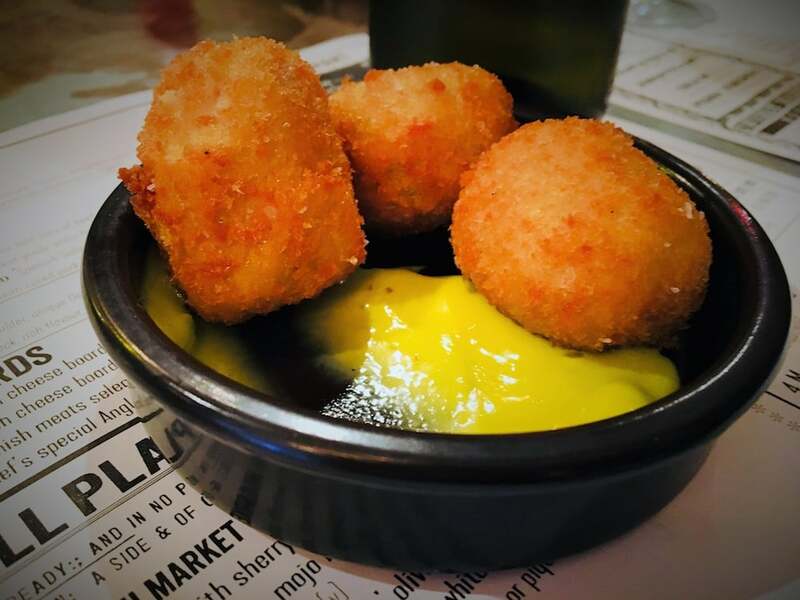 Cheese-filled Croquettas with Piquillo Peppers or Chorizo, depending on your preference, and handmade basil aioli go straight down the hatch. “Snap, snap” – I hear those go across to the “babysitter” too. Market is literally famous for its signature grilled Broccoli, Crispy Kale and Tahini dish – generously assembled from the grill and literally singing with umami. But I am so smitten with an assembly of tangy summer salad with Peas, Lemon, Samphire and salty fried Burgos and Manchego, I barely look up. 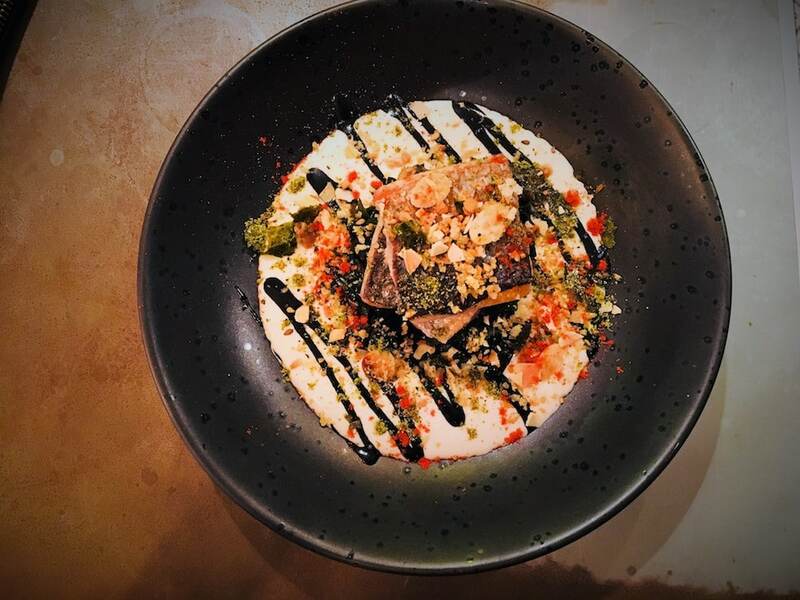 Also cooked a la plancha, and literally flipping with freshness, Grey Mullet perched on a little bed of delicious creamy white almond sauce and wakame – finished with Squid Ink Aioli and assembled lovingly on to a plate. If I have any more wine, there is possibility I might steal that plate. From my bar-side seat I literally grill the Head Chef about the ingredients. There are no oily claypots in site. The simple menu is another reason to love this place. Neatly sectioned into Greengrocer, Fishmonger and Butcher, in a world of ordering for range of people with different tastes The Market is a godsend. 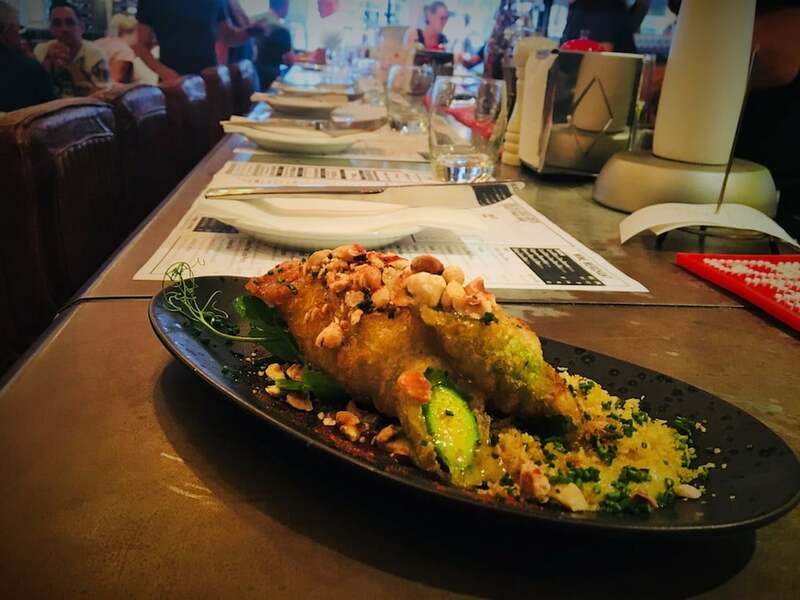 From the Fishmonger, arrives an all singing and dancing plate of seasonal Courgette Flower, lightly battered to perfection and paired with creamy bacalao (salted fish), and peashoots. Far from being heavy, the dish is the perfect balance of summer citrus crunch. Absolutely glorious stuff. The Market’s mix of simple tables, open plan bar-side seating and a hidden private dining cove has been imitated all up and down the High Street for a reason. 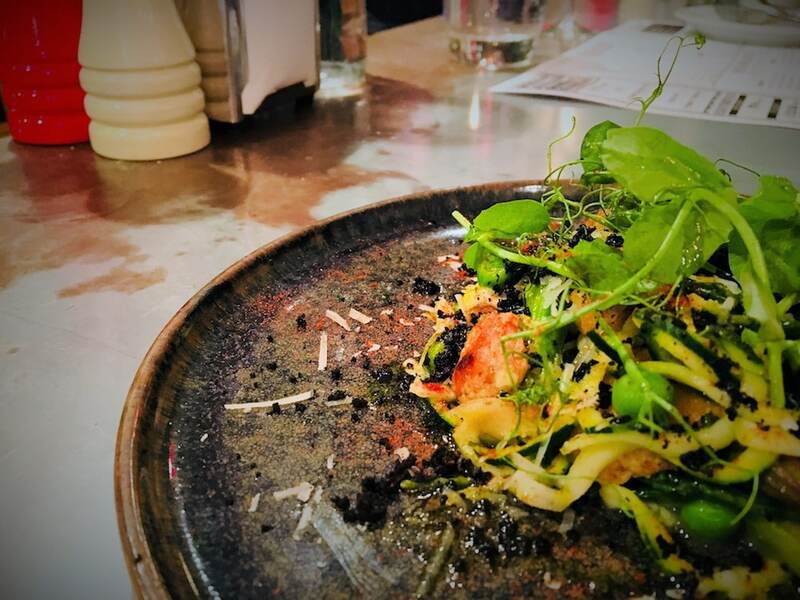 The restaurant lends itself to conversation, meaning The Market is the place to go where you don’t feel dictated by the space, and with lively, vocal Front of House and Chef teams, you don’t feel the need to keep your voice down either. 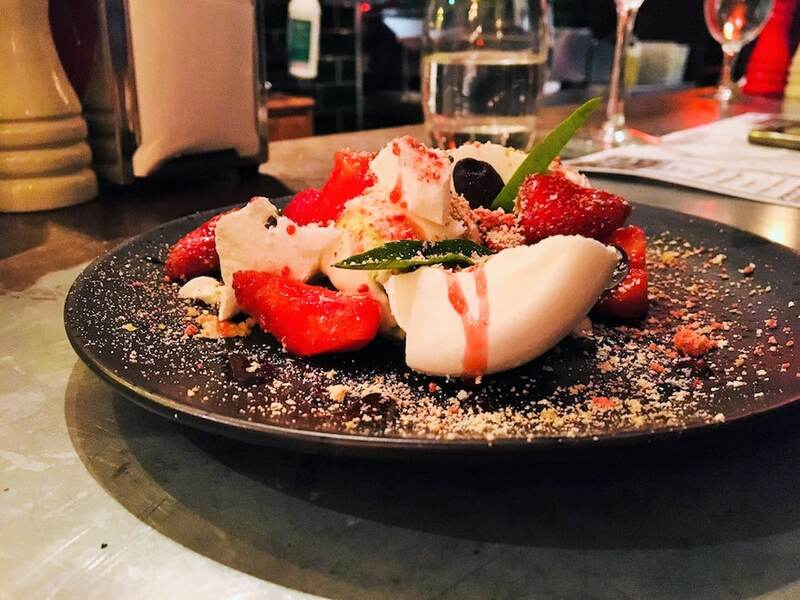 It is the ideal place to catch with an old (or new) friend and savour small plates of your choice, lingering over dessert – in our case a plate of fresh berries and meringue and homemade truffles. The Market Restaurant & Bar is one of those modern oddities, beloved by locals, raved about by visitors and as frequented by respected foodies as it is by Brighton Albion football players, who regularly drop by for what is rumoured to be the best Sunday roast in town. So why should you trust a seasonal fusion of British and Spanish ingredients, and is it OK to open a restaurant with a Spanish-inspired menu? Of course, if you consistently break the rules then you should do it well.